Currently we do not list item in option on Amazon Channel. Please visit our Storefront to find same version but different length meshband. Usually, our product name use AA, AB, BB, etc to stand for different length version. 16mm Purple Classic Croco Grain Leather Watch Band Strap (Quick Release Pins!) 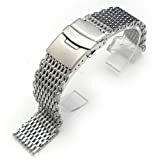 with Stainless Steel Buckle – Fit’s All Watches!! !